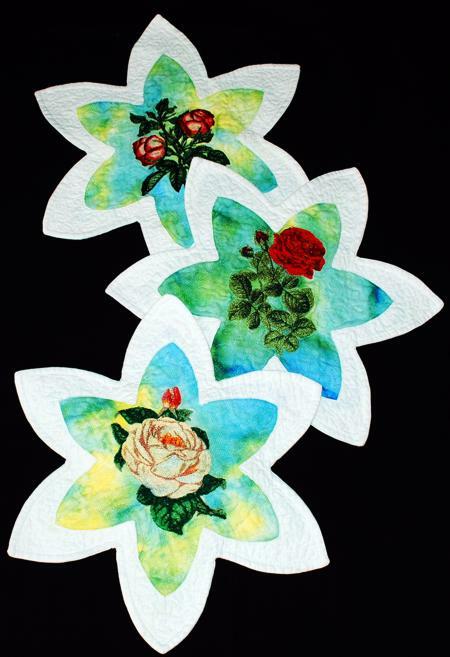 The Rose Table Mats feature a unique floral shape that make them stand out. They are both a practical and beautiful decoration for your home, and make a great gift. 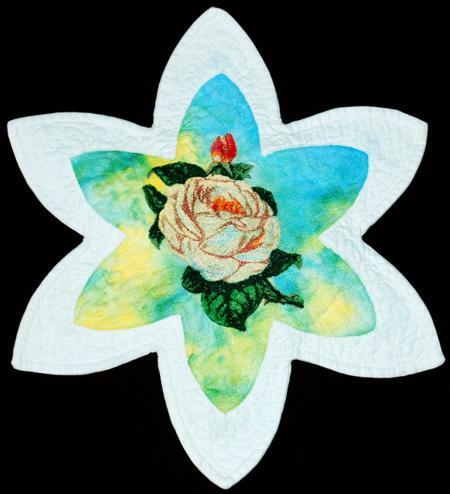 The embroidery designs used in this project are the Ivory Lace Rose, The Dark Lady Rose,and Catherine Rose for the large (5" x 7") hoop. The finished size of each mat is about 16 1/2" in diameter. 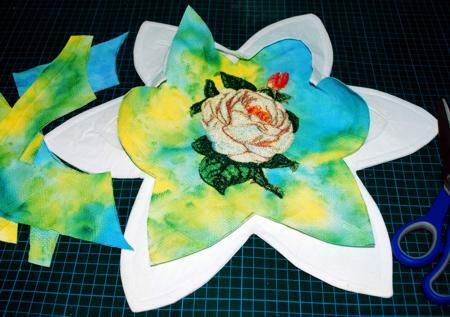 graphic pencil, scissors and fabric glue (optional). 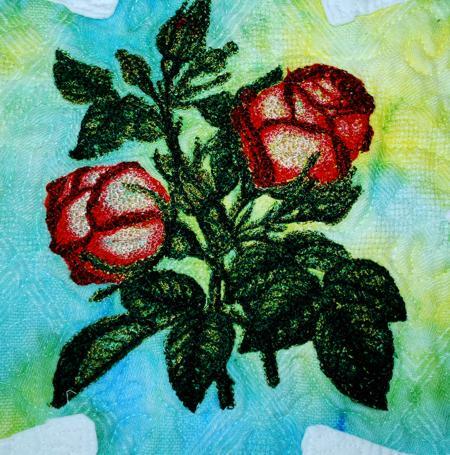 Stabilize the fabric for the central part with medium-weight cut-away stabilizer for embroidery. Print out the color card. 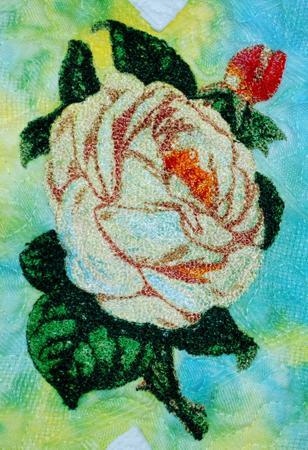 Select embroidery threads according to the color card. 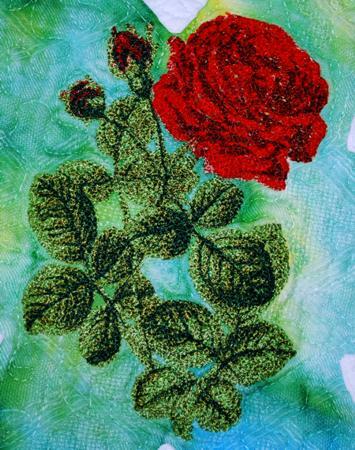 Upload the design into the machine and embroider it. Step One: Download the file with the template. To open and print the template, which is a PDF file, you will need Adobe Reader or a similar program. The program is free to download and install. 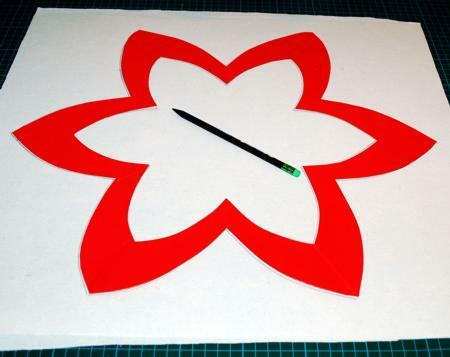 Step Two: Print out the template, cut it out and connect the parts for the template. 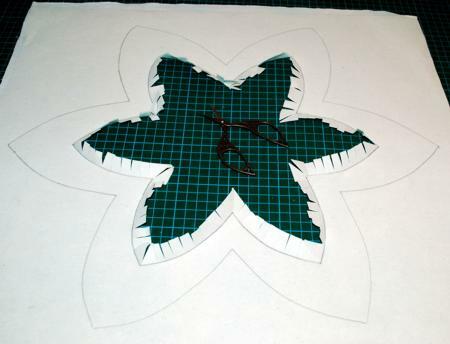 You can use tape for this, or trace the parts of the template onto a large sheet of cardstock and cut it out again. 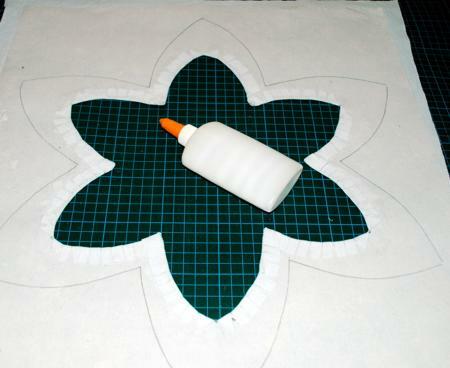 Step Three: Adhere the fabric for the top to the iron-on cut-away stabilizer or interfacing. Lay the piece out with the stabilizer facing up. Position your template over the stabilizer and trace the template with a pencil. 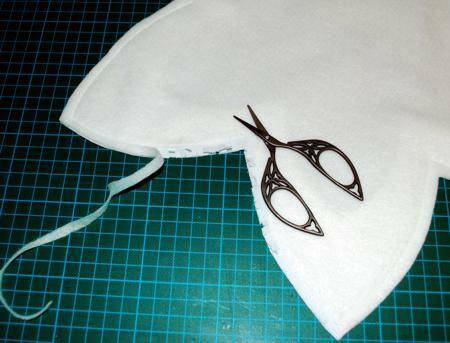 Step Four: With a pair of sharp scissors, cut out the central part 1/2" from the inner line. 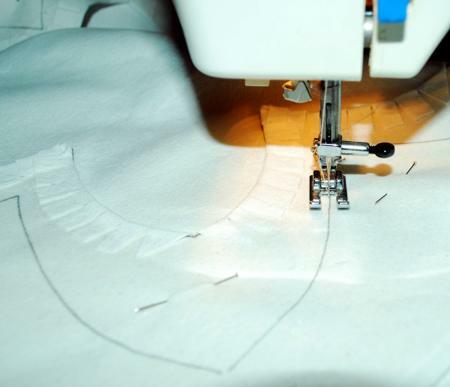 Cut notches into the seam allowance from the edge to the inner line. 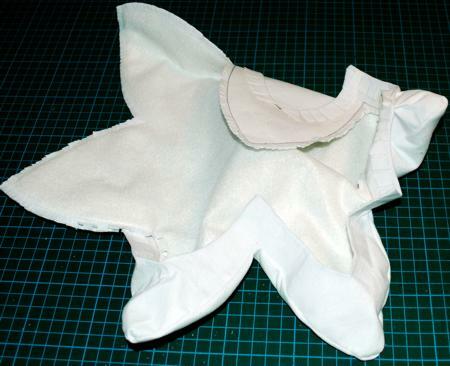 Step Five: Fold the notched fabric back, press. 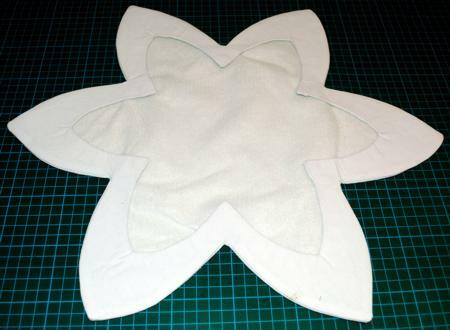 Optional: using fabric glue, adhere the notches to the stabilizer. Leave to dry. Step Six: Position the batting on the table and cover with the fabric for the backing, face up. Cover with the working piece, face down. Pin all the layers together. 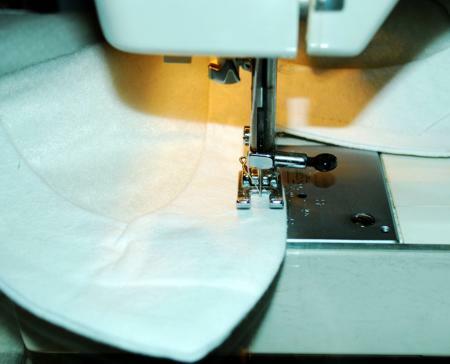 Step Seven: On your sewing machine, topstitch along the marked outer line. Step Eight: Cut away excess fabric and batting along the outer line leaving about 1/4" of seam allowance. Then cut away the batting under the seam allowance close to the stitches. 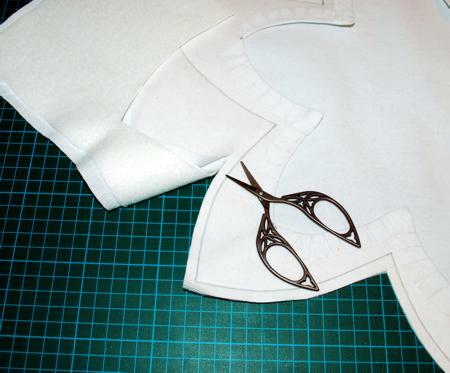 Cut notches in the seam allowance. Step Nine: Turn the working piece right side out and lay flat. 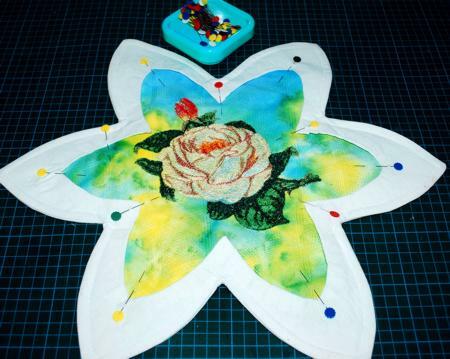 Take your time to straighten all of the petals. Press the seams, if needed. 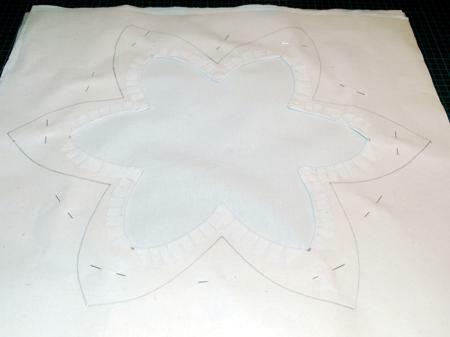 Step Ten: Top-stitch 1/4" from the outer edge. 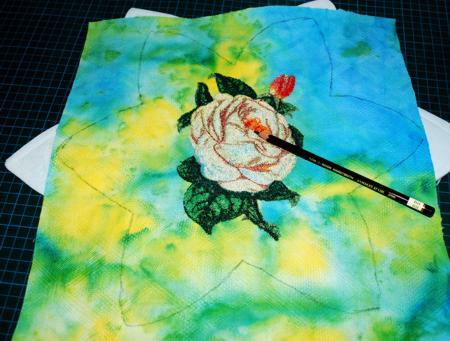 Step Eleven: Using the template, trace its inner line with a removable marker over the fabric with the stitch-out. Cut out with 1" of seam allowance. Step Twelve: Insert the central part with the stitch-out into the "frame". Step Thirteen: Pin all layers together. 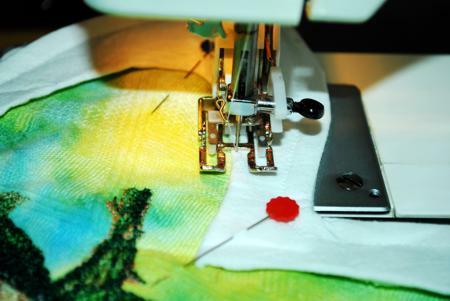 On your sewing machine, topstitch along the inner line of the frame. 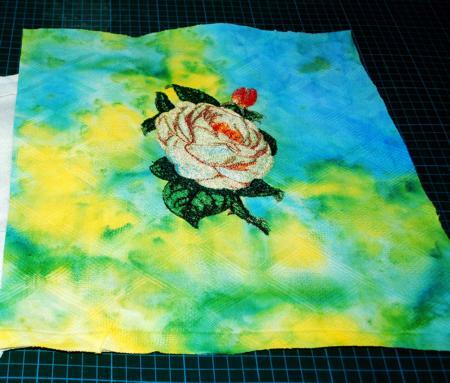 Then quilt around the embroidery and all over the piece. That's it! The table mat is done!